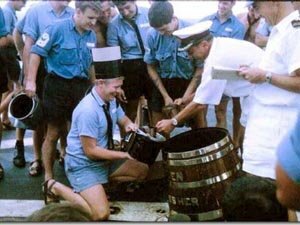 The crew of HMS Phoebe, receive the last of their rum rations. And thank you, good luck and goodbye." Navy Grog from Beachbum Berry's "Grog Log." Heat honey until liquid, then mix with juices in blender. Stir in rums and soda. Pour into a double old-fashioned galss filled with crushed ice. I've been waiting a long time, but I finally got my copy of "Beachbum Berry's Grog Log." I ordered it on May 28th from that mega-mega on-line bookstore. It never arrived. I canceled my order because Tiki Objects by Bosko saved the day. Bosko quickly sent out my grog log and a really nice Moai Tiki Mug. There was a slight mistake in shipping, but the good people of TikiBosko resolved the problem before I even knew there was a problem. The customer service was excellent, and the products are top-notch. I can recommend tikibosko.com wholeheartedly. The "Grog Log" is crucial for anyone interested in Tiki Drinks. If you don't have it yet, or if you need some tiki accessories, check out TikiBosko. from "Beachbum Berry's Grog Log." Blend without ice and pour into a tall glass or tiki mug filled with crushed ice. Top with a shake of nutmeg and a pinch of cinnamon. Garnish with pineapple stick, orange wheel, and cinnamon stick. 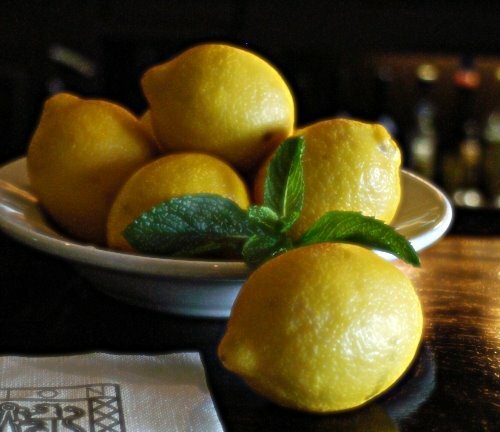 Don't forget about Mixology Monday this week! Hosted at jiggle the handle, the subject is Lemon.